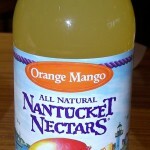 I have reviewd quite a few products from Nantucket Nectars on my site. I have had some people searching to find out where to purchase Natucket Nectars. Below is my list of places that I know of where you can get their juices. Most of my locations are in Michigan, because that is where I live. Feel free to leave comments on where you have found them and I will add them to my list. We get Nantucket Nectar at Chipotle Restaurants.